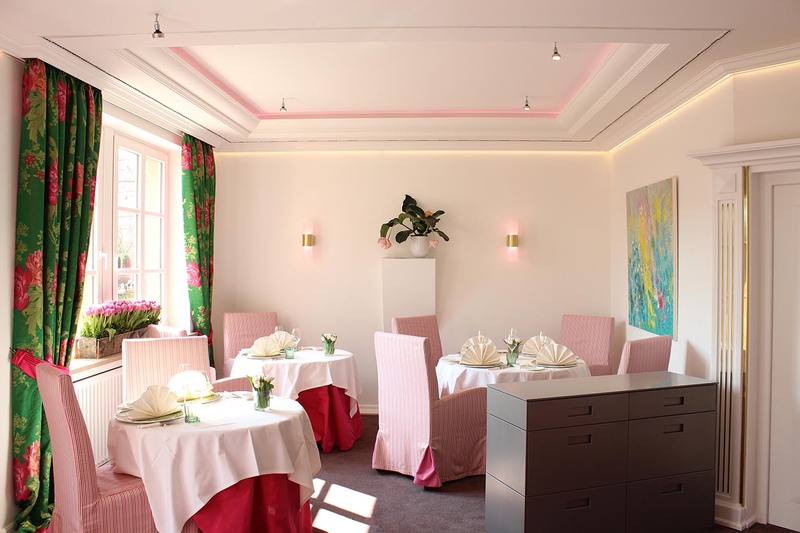 Star chef Johann Lafer runs the exclusive “Le Val d’Or” restaurant in the 1000-year-old “Stromburg” castle in the Hunsruck. As part of a new concept focussing on the seasons, a lighting plan was designed that would support the quarterly changes visually by using ‘lighting scores’ and video projections. Johann Lafer welcomes lovers of gourmet cuisine to the “Val d’Or” restaurant. A native of the Austrian state of Styria, he sets store by regional and seasonal products and embraces this philosophy wholeheartedly. 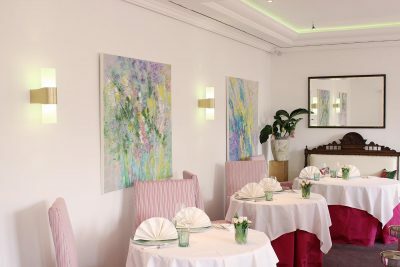 Guests experience this as they savour the culinary delights and enjoy their meal in surroundings where the interior design takes on the colours of spring, summer, autumn and winter. The role of the lighting is to create an atmospheric setting with changing coloured lighting schemes that provide visual accompaniment to the taste experience. 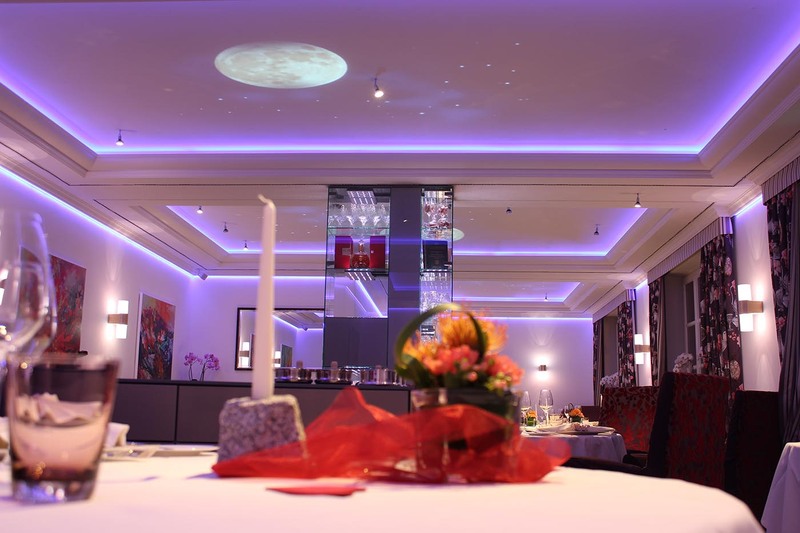 Swivelling ceiling spots ensure perfect illumination and faithful colour rendering for the food and drinks. 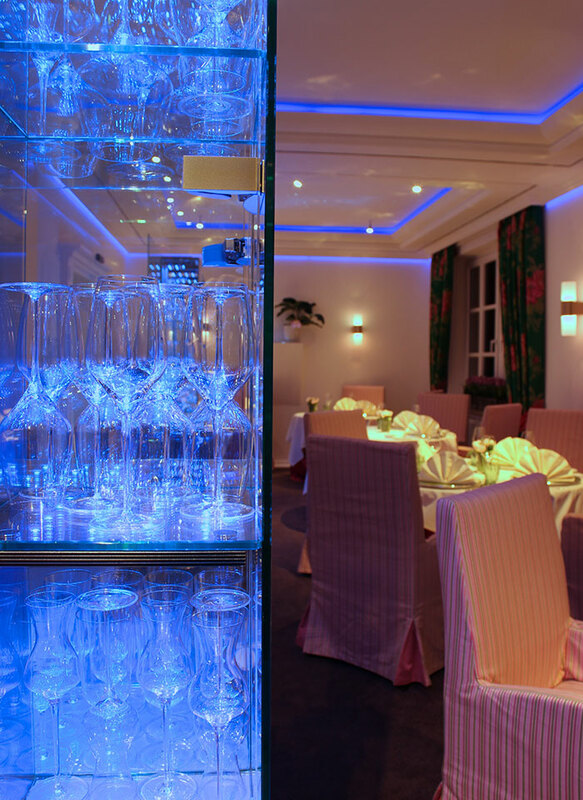 They were designed as a bespoke light and provide flexible white lighting in the room and over the tables. The LED plugin spotlights, which can be dimmed and regulated, are installed as needed using miniature sockets in the ceiling. The connections are concealed by magnetic aluminium caps that match the colour of the ceiling. 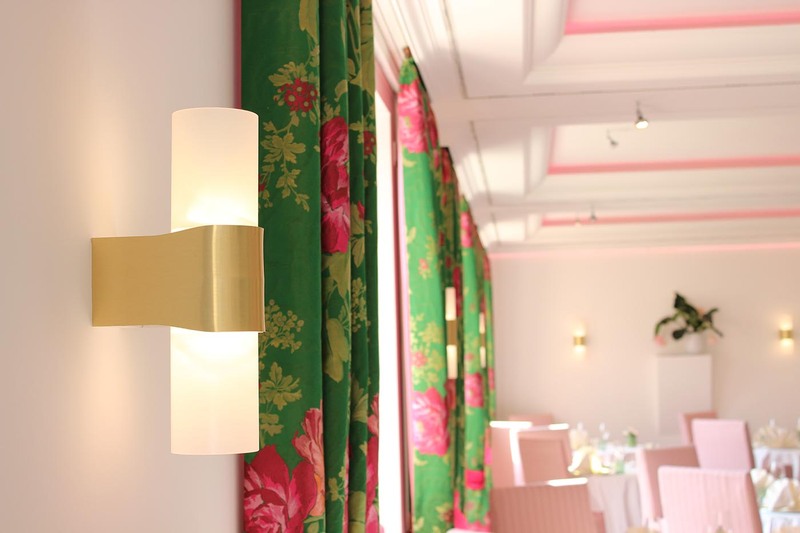 The changing coloured lighting operates with LED technology via cornices, wall and cabinet lights. 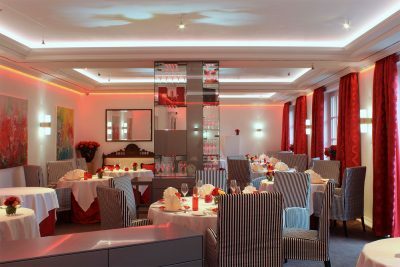 The ceiling and wall surfaces in the restaurant are illuminated in a different colour depending on the season. 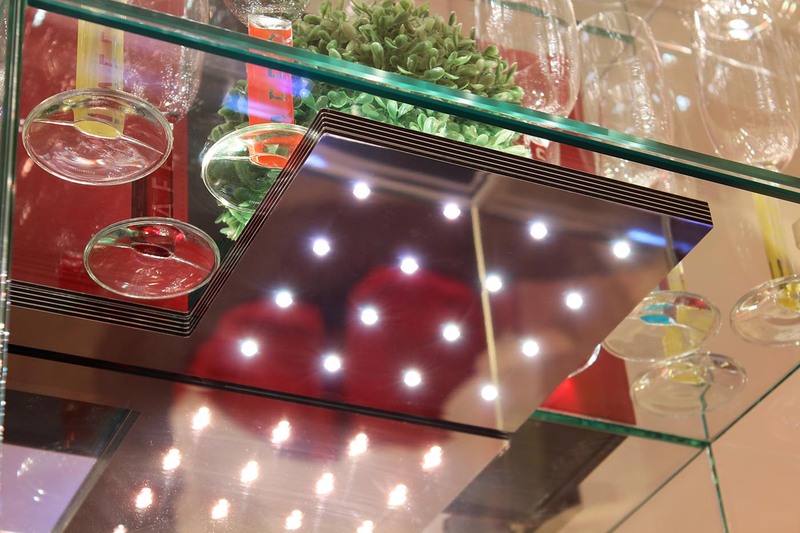 Both the wall lamps and the 1cm-wide glass display cabinet lights are custom designs. 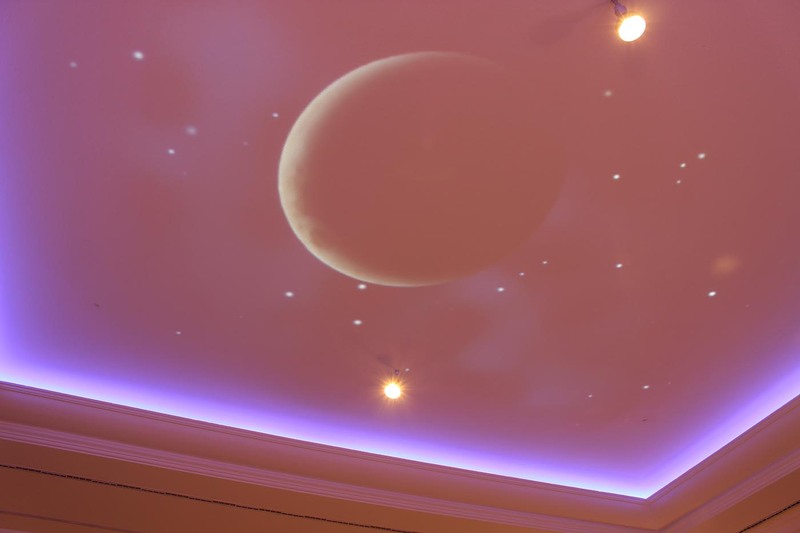 Projections on the ceiling complete the lighting design. They are activated in the evening and are generated via a data projector in the glass display cabinets. The seasons are depicted symbolically using colours and motifs: spring is pale green, pink and white, summer is red, black and white, autumn is rust-red, green and brown and winter is silver, black and white. The lighting schemes create an ambience for day and for night; the transition is gradual and is only perceived unconsciously. 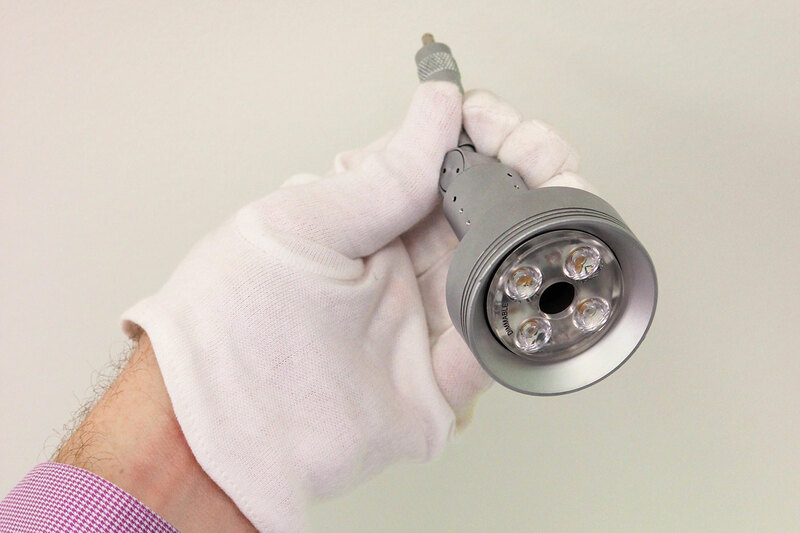 The white light from the wall lamps gives a cooler light of 5000 K in the daytime; in the evening the light is a warmer 2200 K. A special app is used to retrieve the four pre-set ‘lighting scores’ for the seasons and music; the brightness of the white and coloured light can be adjusted.